If you want to make your prediction more dramatic, this is certainly one way of doing it! Use an ESP deck and force a card with the symbol you want to use. Use a cross for Gospel Magic and "Fire Spirit Write" the Holy Cross. Find out someone's name prior to the performance and select them as a spectator and "Fire Spirit Write" their name. Use as a way to calculate the bill at a restaurant. Of course you must know the total of the meal ahead of time. Put tissue paper in a frame with a red background and paint the outline of a heart on the white tissue paper. When it burns through you will have a red heart! Have fun with these ideas, and we are sure that you will come up with many great ideas of your own! Never use on Flash Paper, Flash Cotton, Flash String, or any other combustible powder or solution. Use only on white tissue paper, the kind used in gift wrapping. Paper should be cut into six inch squares. Do not put the solution on too heavy, because it may become noticeable after it dries. All letters must touch the next in sequence for the trail of fire to continue. 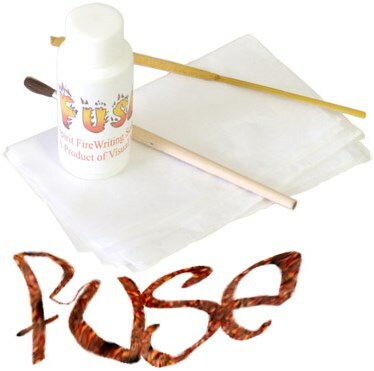 Keep all pre-made tissue papers with images painted on in a ziplock bag until ready to use. When using matches, use stick style matches and always let the match burn for at least ten seconds. This will make most of the match head burn away, leaving a smoldering matchstick when you blow out the match. The smoldering is what ignites the FUSE solution.